We’ve previously looked at The Fever of Urbicande‘s prologue, which sets up Eugen Robick’s status quo as the story starts. This time, we’ll explore some fascinating parallels and implications of that status quo. Also, I’ve previously introduced The Obscure Cities series and discussed its first volume, The Walls of Samaris. You don’t need to read them to understand this article, but they’re there if you’d like more. Before continuing to the comic itself, it’s important to address a couple specific issues implicit in this prologue — issues which will continue to play out in the narrative. The first is merely an informative correlation between characters, while the second is more important, not only to this particular story but to The Obscure Cities. 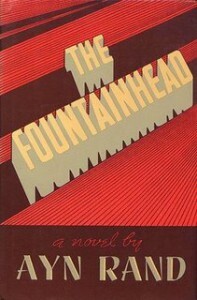 At this point in the story, Robick’s situation strongly recalls Ayn Rand’s 1943 novel The Fountainhead (adapted as a 1949 film directed by King Vidor and starring Gary Cooper). Its story revolves around an uncompromising architect named Howard Roark who similarly disparages the intermixing of artistic styles. Roark winds up dynamiting a building rather than let his original plans be altered. Rand intended him to be unequivocally the hero, a visionary in a world that celebrates compromise. Superficially, the correlation between Eugen Robick and Howard Roark, at this point, is considerable. Robick is focused on Bridge Three and the completion of his original design, much as Howard Roark refuses to compromise about his Cortland housing project, and both are effectively at the mercy of their more powerful clients, who are insensitive to aesthetic concerns. But the two architects’ styles couldn’t be more different: Howard Roark was based on real-life architect Frank Lloyd Wright, known for structures that accommodated their environment; the same could hardly be said for Robick, whose large, geometric structures have nothing in common with Wright’s. Also, the two men have a different temperment: Robick’s letter is a show of submission to bureaucratic authority that Roark would never make. And Roark has designed his housing project anonymously, with a promise that it won’t be changed, whereas Robick is clearly not anonymous and it’s not clear to what extent the High Commission, although it approved of his plans, promised not to alter them. And of course, Robick isn’t an architect concerned with a single building; he’s an urbatect concerned with an entire city; the scale is vastly different. Robick also wishes to expand his project even further, which isn’t the case with Roark’s project. Moreover, the bridge affects the entire city’s function, not merely a single skyscraper’s design. These differences, however, are superficial compared to the far more major one: Roark’s project affects people, but he explicitly denies any social responsibility, instead focusing on its own integrity and decrying altruism. This is the novel’s anti-collectivist political message, which has everything to do with Rand’s reaction against the horrors of Russian communism, to which she’d been subjected in her childhood. Robick might not be sensitive to the plight of the North Bank, but he certainly sees addressing it as part of his job as an urbatect. It’s perfectly clear to him that architecture involves politics and affects society. In fact, this is one of the themes of The Fever of Urbicande and of The Obscure Cities more generally. That’s implicit in The Fountainhead, but it cannot afford to look at these issues, because of its reaction against collectivism and its focus on the individual. The Fever of Urbicande will make the social its focus, and it will consequently take its narrative in a very different direction. In this way, one could read The Fever of Urbicande as a response — or even an antidote — to The Fountainhead. Here in the prologue, Peeters and Schuiten establish a status quo that’s superficially very similar to Roark’s dilemma about the Cortland housing project. But instead of proceeding through radical individual action, as Rand does, Schuiten and Peeters will create a narrative defined largely by individuals who are at the mercy of larger events. They take a Roark figure and inject a single fantastic device, then explore the social and political ramifications. And those ramifications, while hardly collectivist, are surely the political antithesis of Rand’s political message. Indeed, even in this prologue, it’s not clear at all that Robick, while a proud visionary, is at all intended to be the sort of ultra-heroic figure that Rand makes Roark. We’ve already seen his elite attitude towards the North Bank and his sense of privilege. But it’s also not clear at all that his vision for the city, nor even his occupation as urbatect, is really a good thing at all. In architecture, the term “brutalism” is describes a certain style of modernist architecture from the 1950s to the mid-1970s. Brutalism (from the French béton brut or “raw concrete”) is known for its frequent use of concrete (though this is not a requirement) in often large, geometric patterns that tend to expose, rather than disguise, the buildings’ functions. For many of its creators, this functionality had a deeper philosophical point, tied to socialism; brutalist designs may be inventive, but they are rarely ornamental. This functionality may also be tied to one of brutalism’s most often voiced criticisms: that it ignores its buildings’ surrounding, imposing these functional, concrete structures upon historical environments, which can sometimes make brutalist buildings seem out of place. This, combined with brutalism’s often concrete, functional appearance, has led many to consider the style to be uninviting. In fact, they are sometimes seen as implicitly totalitarian, and while some beautiful brutalist structures certainly do exist, many now appear ugly, instantly reminiscent of blocky Soviet institutional buildings or uninventive, concrete housing projects. More generally, outside of its narrow context as a historical, the term “brutalism” can be applied, both forward and backward, to describe buildings with similar traits, in the same way that “baroque” or “modernist” describes both a specific period and certain traits, irrelevant of their historical place. In this sense, “brutalist” connotes large-scale, urban, geometric concrete structures that impose themselves on the environment and suggest totalitarian thinking. Retroactively, brutalist architecture is indeed found in several totalitarian governments of the 20th century. In this context, the size of the building itself suggest the might of the regime, an idea that goes back to antiquity. Such structures are often said to have been intended to impress potential enemies, although they are in practice meant at least as much to intimidate and suppress internal dissent. Although the art historical establishment might scoff at the idea, largely because of the huge historical incongruity involved, one could even call the pyramids of Giza brutalist, after a fashion. They certainly are large-scale structures, defined by their geometry, although they don’t appear to have been particularly functional. And of course, they aren’t made of concrete, although they are made of stone and originally had that same, concrete-like uniform appearance. We now think of them at home in the desert, but they certainly were designed to impose impressively upon this environment. On the Great Pyramid, this ostentatious, imposing effect was originally enhanced by a surface of polished white limestone (some of which still preserves), which probably reflected the sun. A 19th-century photo of the Great Pyramid, imposing upon its environment. 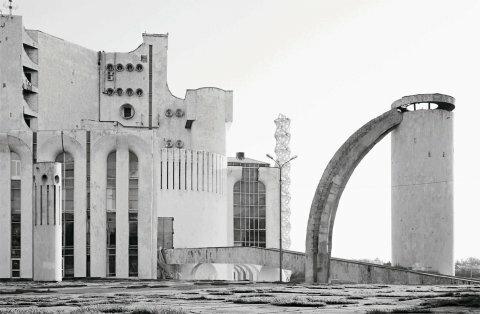 Proto-brutalism? This same imposing effect may be seen in other pyramids modeled after those in Egypt, from the much smaller pyramid at the Louvre, which deliberately clashes with its surroundings (and was initially reviled largely for this reason), to the pyramid outside the Luxor in Las Vegas. Of course, Eugen Robick references the Great Pyramid as an example of the need to complete his project. And whether or not the Great Pyramid may be considered a brutalist structure, one can understand why it would appeal to a brutalist. 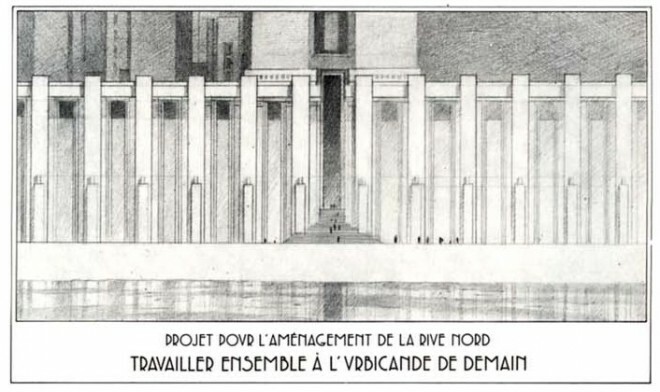 And while we’re on the subject of totalitarianism and imposing structures, it’s worth looking at two building projects that were never realized by were proposed by the most famous totalitarian governments of the 20th century. They’re only brutalist by the widest definition of the term — monumentalist would be a better term — but they do illustrate certain brutalist principles, as well as how architecture can reflect totalitarian values. The first of these is Adolf Hitler’s plan to rebuild Berlin, largely under architect Albert Speer — a plan subsequently termed Welthauptstadt Germania but barely begun before the Third Reich fell. Like Robick’s Urbicande, the plan called to bring order to the design of Berlin, which was to be organized around a miles-long Avenue of Splendors, terminating in the north in an enormous forum. On its north face was to stand the People’s Hall, or Volkshalle, a massive domed building designed by Hitler himself that, had it been completed, would have included both the largest dome and the largest enclosed space in the world. Near the avenue’s southern end would have stood a triumphal arch, modeled after Paris’s Arc de Triumphe, but again blown into proportions so large that the Arc de Triumphe (then the largest triumphal arch in the world) would have fit between the new arch’s legs. A model of Hitler's never-completed Welthauptstadt Germania. Note the sense of order, geometry, and massive dimensions. Everything about Germania was to be done in the same huge, imposing, and arguably ridiculous proportions, imposing itself completely upon the landscape. And in the triumphal arch, a type of structure with deep art historical roots, one sees the brutalist, totalitarian impulse writ laughably large. And there’s a massive insecurity on display here, in the same way that all ostentatious displays of power suggest insecurity, the opposite of their intent. In fact, Germania’s triumphal arch was to have been a monument to World War I, which Germany lost. As if, by its very size, the arch could rewrite history. 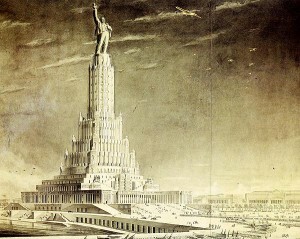 Slightly earlier, Joseph Stalin planned to build a different ostentatious, totalitarian structure in his capitol, Moscow: the Palace of the Soviets. 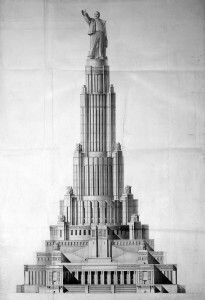 Its design was the product of a protracted and much-publicized contest, from 1931-1933, and a cathedral was demolished on 5 December 1931 to make room for the building. After a winner (architect Boris Iofan) was chosen, Stalin himself gave notes, insisting the design be even larger and more ostentatious. The resulting design, unveiled to the public in March 1934, would have been the tallest building in the world, at 100 floors and 1392 feet, 100 feet taller than the Empire State Building. On top of that was to have been a 260-foot statue of Lenin. The design received widespread coverage around the world, including in U.S. magazines, and it featured prominently in Soviet propaganda posters and was inserted into some wartime Soviet films. The foundation was completed in 1939, and the steel frame for the lower levels had been erected by June 1941. 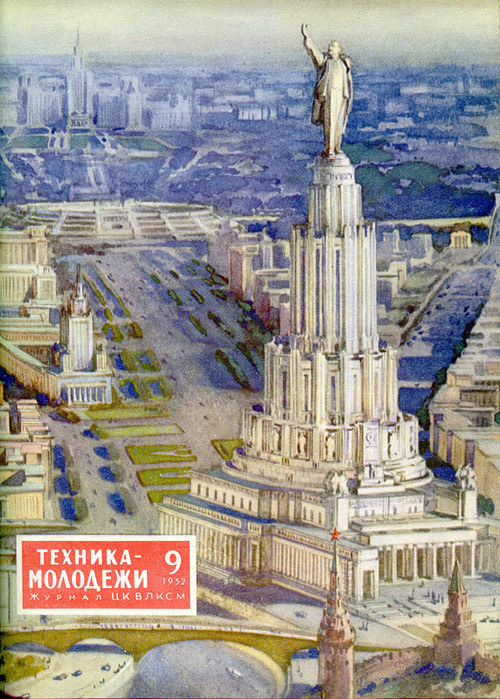 But the German invasion interfered, and construction never resumed — although for years, Moscow skyscrapers were positioned in reference to the Palace of the Soviets, and the building’s flooded foundations remained under guard until 1958. 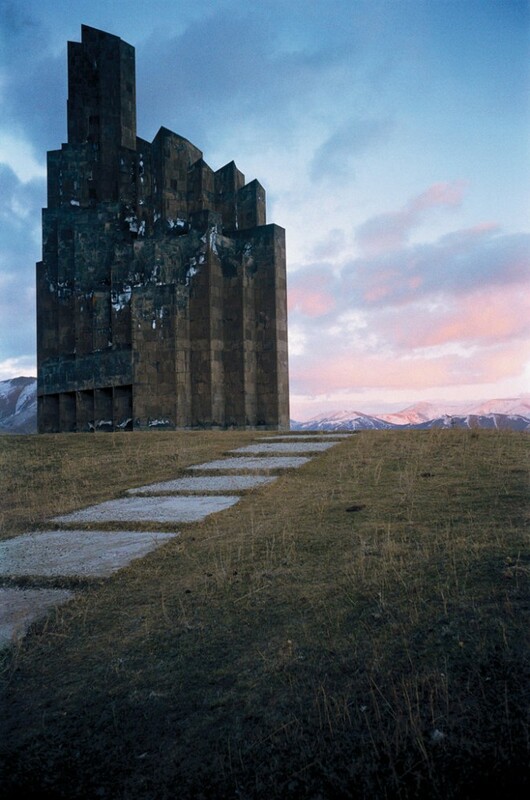 Massive geometric buildings that impose themselves on the landscape, while associated with brutalism, have long been used to carry totalitarian messages. Of course, not all monumental architecture is necessarily totalitarian: The Obscure Cities is certainly filled with monumental buildings, and most are more fantastic and dreamlike than totalitarian. And there’s no denying that, as odious as the messages Germania and the Palace of the Soviets were intended to carry for their real-world regimes, these designs can be pleasing to think about — just as there’s pleasure in the monumental architectural designs of The Obscure Cities, which exist only in fantasy and are not intended to be produced, let alone to reinforce genocidal real-world governments. But Schuiten and Peeters know their art history, and they’re certainly aware of the totalitarian implications of monumentality. It’s a connection they explore at times, while ignoring at others. And it’s particularly apt that we examine, in the context of this fictional series’s imagined architectures, these two real-world construction projects that were never completed, probably could never have been completed, and now feel as they are glimpses into alternate realities. If one is familiar with brutalism and the ostentation of totalitarian architecture, it’s hard not to notice that Robick’s designs, accompanying his letter, contain several of these characteristics. While more elegant than most brutalist architecture, they seem large, defined by largely unadorned geometric shapes, and concrete. The final image features a monumental wall with another large staircase, and it’s notable that this is labelled as part of Robick’s plan to reconstruct the North Bank. In other words, here’s the totalitarian order that Robick seeks to impose upon the city’s poor. Underneath this is written the propagandistic slogan, “Work together for the Urbicande of Tomorrow,” which sounds like it could have come straight out of a Soviet propaganda poster, perhaps featuring the Palace of the Soviets. And of course, this fits perfectly with what Robick has implied in his text: that he sees his mission as imposing order upon the city, destroying its old buildings and replacing them with a top-down plan designed to affect the soul and feelings of the city’s inhabitants and visitors. Moreover, he seems perfectly comfortable imposing this not only on his own South Bank but upon the North Bank as well. Why, he’s even gone so far as to draw up an illustration of that plan, prior to its approval. Now, there’s no indication that Robick thinks of himself as a totalitarian, nor that he’s anything but a well-meaning guy. But that doesn’t mean that his thinking isn’t totalitarian. Nor that his entire project of redesigning a city doesn’t carry totalitarian project. After all, it does do violence to the older, historic architecture already there. In this way, Schuiten and Peeters have already come to question Robick’s project and its underlying assumptions, even in the prologue. The violence of Robick’s project, contrary to the city’s admittedly chaotic architectural past, also raises another topic: the concept of Brusselization. The term stems from the renovation of Brussels, the capital of Belgium and a hub for international diplomacy, including both NATO and the European Union. (In French, the city is called Buxelles, and the corresponding term is thus Bruxellisation.) Born in Brussels to a family of architects in 1956, Schuiten appreciated the city’s architectural history, including its Art Nouveau structures by Victor Hota, a love he would later reflect in his design of Xhystos for The Walls of Samaris. But beginning in the 1960s, the city began demolishing many historic buildings to make way for office blocks and business buildings, patterned on New York City, which had come to symbolize contemporary commerce. It is this pattern, of demolishing old and historic buildings to make way for the new, to which Brusselization refers. In fact, many other European cities felt the same pressure. In the same period, skyscrapers also began to rise in the la Défense district in the outskirts of Paris, creating a thriving business district through different waves of construction, coinciding with economic ups and downs. The eventual result was the creation of an American-style, business-dominated downtown for the city, although one separate from the historical Paris and thus preserving the city’s patrimony. Brussels took a different course, at the cost of some of its patrimony. Of course, a good deal of these business buildings could be classified as brutalist. They were predominantly functional, concrete buildings that imposed themselves upon their environment, without consideration to the history or the look of their surroundings. Ironically, because of his architectural family, Schuiten’s father and brother were significant participants in Brusselization, designing some of the new buildings. But Schuiten objected to it. And although he was raised to study architecture, both at home and in university, he eventually abandoned it, having also grown up loving comics. And with The Obscure Cities, he finally found a way to express his thoughts about Brusselization in narrative form. The theme of Brusselization runs throughout the entire series, to one extent or another. It’s even present, implicitly, in the first volume, The Walls of Samaris. 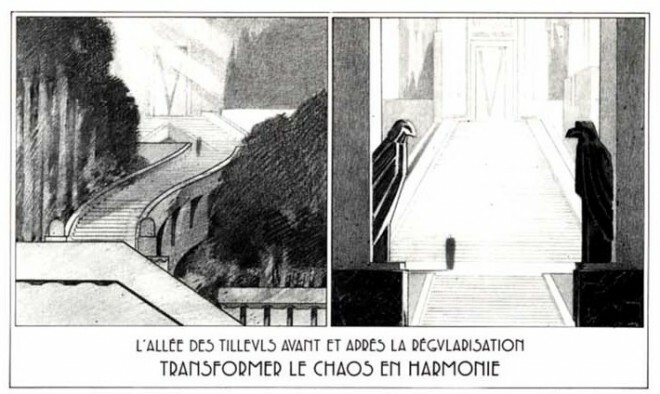 There, Schuiten imagines an entire city based on the Art Nouveau he loved in Brussels. The tome subtly suggests that Xhystos was not always this way, which implies an ironic inversion of Brusselization, in which the city’s historic architecture was stripped away to make room for a towering Art Nouveau paradise. It’s almost an architectural revenge fantasy. After all, once one’s started demolishing a city’s architectural patrimony to make room for the current architectural style, one’s own constructions are vulnerable to being treated with the same disdain, once trends shift. Moreover, Samaris may be seen as reflecting the hollowness of widespread urban construction plans. But with both cities, the idea of Brusselization is only implicit, not part of the actual narrative. With The Fever of Urbicande, Brusselization is part of the narrative itself. It’s implicit in Eugen Robick’s project. And when he refers to the North Bank as “the canker that eats at our city,” he continues by citing “the disorder of these buildings from another age.” Clearly, he doesn’t see these buildings as historic, as a precious part of his city’s patrimony. Instead, he sees only disorder that ought to be replaced with new structures, as part of an ordered plan. We likely identify with Robick, as an artist fighting against a bureaucracy that clearly doesn’t understand that the lack of Bridge Three entirely defeats his designs. But this design has apparently already leveled and replaced his half of the city, and he would like to continue this process into the poorer North Bank. That’s perhaps admirable for its ambition, despite Robick’s elite perspective and lack of real social consciousness. But as much as we may identify with Robick, we also need to understand that this urban renewal comes at a very real price. Brusselization won’t be the story’s dominant theme, any more than it was in The Walls of Samaris. It would be explored far more directly in a later volume, Brüsel. But it is important to discuss here, as we examine Robick’s situation at the opening of The Fever of Urbicande. And Brusselization, like Robick’s project, will hang over the entire story, even if that story quickly veers off in a very different direction.